Americano: Ice, 1 measure Tesco Sweet Red Vermouth, Soda water chilled, 1 piece of lime, 1 Maraschino cherry. Put ice into a tall glass, add vermouth. Stir well until mixture is well chilled. Top up with chilled soda water. Decorate with a piece of lime & Maraschino cherry. Contains sulphites. Contains Sulphites .. This is a world famous, classy drink. Can be drunk on the ice or with other soft drinks as the perfect appetizer. 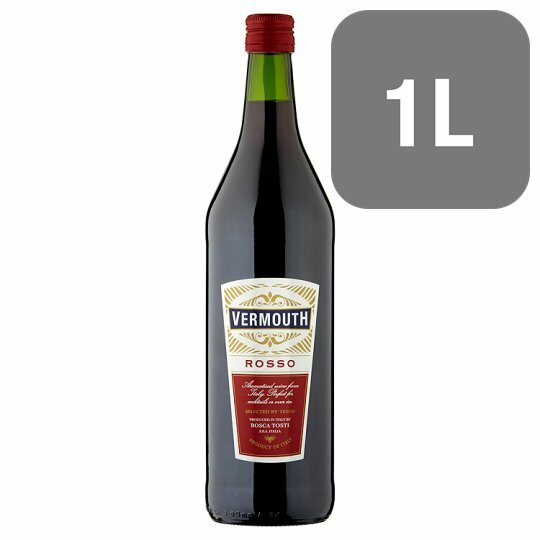 The production of vermouth begins with the base of a neutral grape wine. Additional alcohol and a proprietary mixture of dry ingredients and botanicals, consisting of aromatic herbs, roots, and barks, are then added to the base wine. The finished fortified and aromatized wine is either used as a basis for cocktails or consumed as an aperitif. Tosti has been producing still and sparkling wines since 1820. This family-run estate has witnessed seven generations of the Bosca family at the helm of its operations. The family's heritage is made up of culture and traditions which have led to the identification of the best zones and methods for producing grapes. Two hundred years of experience continue to guide the estate in its choices and challenges. The Piedmont region in Northern Italy has been the centre of Vermouth production for centuries due to the fact that the surrounding hills and mountains provide some of the best essential herbs, aromatics and wine required to produce this world famous product.